Free MP4 Video Converter is a simple yet functional tool to convert video files to MP4 format compatible with popular multimedia devices. Free MP4 Video Converter makes it easy to convert videos to MP4. Simply select your exact device, screen resolution and other parameters from the larger submenu of MP4 Converter. You don't need to worry about degradation after converting your video to MP4 format. Preset Editor lets you edit the video and audio format. Choose among container type, video codec, frame rate, bitrate, width and height of the video. Edit audio format and bitrate of the sound to get high-quality MP4 video. MP4 Converter input file formats: AVI; IVF; DIV; DIVX; MPG; MPEG; MPE; MP4; M4V WEBM; WMV; ASF; MOV; QT; MTS; M2T; M2TS; MOD; TOD; VRO; DAT; 3GP2; 3GPP; 3GP; 3G2; DVR-MS; FLV; *F4V; AMV; RM; RMM; RV; RMVB; OGV; MKV; TS. Follow Start > All Programs > DVDVideoSoft > Programs > Free MP4 Video Converter or just click the DVDVideoSoft Free Studio icon on the desktop. The interface is very simple and self explaining. There is a field for input files, a field for an output path, and the lists with the preconfigured profiles. If you want to change default theme, go to Options → Theme. Click the Add files... button to select an input video file(s) from your computer. By default the output file name is the same as video title is. If you want to change it click the Output Name... button. A new window will be opened. There are some parameters in it (Name Prefix, Postfix and others) which you can set as you like. In the bottom of this window you can see the pattern of the output file name. It's formed according to the current options. Note: the pattern is the same for all output files during one session, it's not allowed to set the unique pattern for each file. Click the Browse... button and choose the location where you would like to save your converted video files. Click Ok. If you want to access the output folder content, click Open. In the list of Presets select MP4, AVI, WMV or multimedia device you want to convert original video to. Then choose one of the pre-configured profiles from the drop-down list according to the selected format or device. For advanced users: read this guide for information on how to customize a preset or create a new one. You can add more information about your output MP4 video files. Click the Tags... button and set the Title, Album, Artist and other parameters as you want. By default the program will automatically fill the title tag and the artwork, taking a snapshot from the middle of video which can be seen in iTunes, Winamp, Windows Explorer. Click OK to switch back to the main program window. Note: By default Tags can't be added to AVI and WMV files. This option is available for MP4 video only. 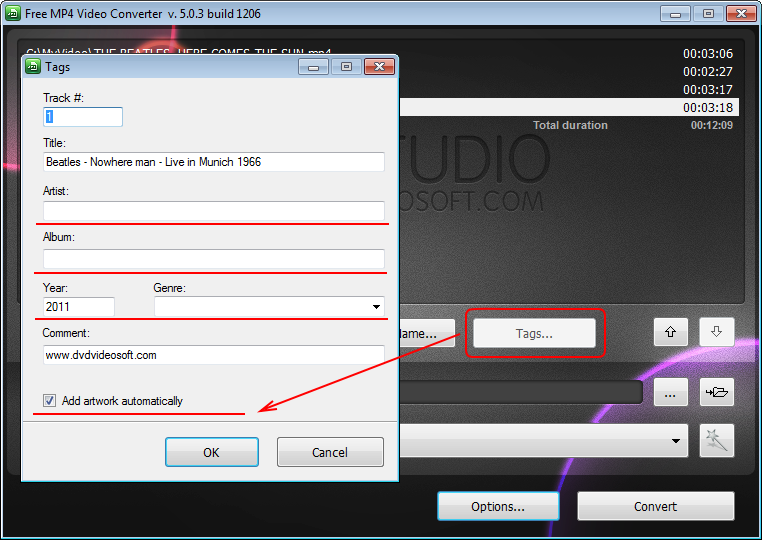 Click the Convert button along the bottom of the interface and wait a video to be converted. Note: Before clicking the Convert button you can set to turn off computer after the process is completed. Just go to Options... and make sure the appropriate box is checked. Description Free MP4 Video Converter is a simple yet functional tool to convert video files to MP4 format compatible with popular multimedia devices.